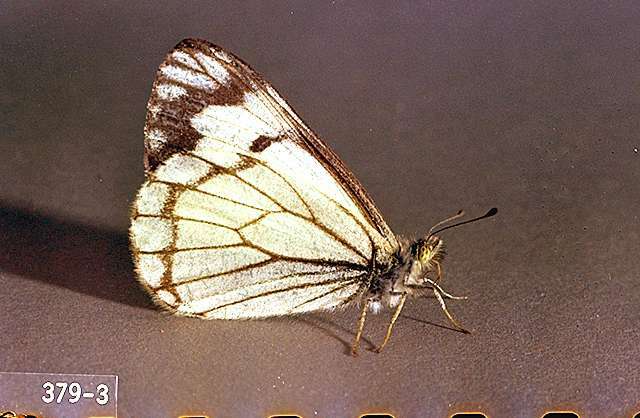 Pest description and damage Adult pine butterflies are white with black markings and closely resemble the cabbage butterfly; females have a yellow cast to the forewings. Females lay emerald green eggs along needles tilted at a 45° angle. The larva of the pine butterfly is a dark green caterpillar with white stripes on the sides and a black head. The caterpillars feed gregariously on the needles: young larvae feed in clusters on the older needles, while older larvae feed in smaller groups or singly. They cause relatively little damage except in years of severe outbreaks. They feed high in the canopy so damage, unless severe, is rarely noticed. Their preferred host tree is ponderosa pine, but they are common in western white pine. Adults are also commonly seen flying around Douglas-fir. In Eastern Washington, the larvae of this butterfly have caused significant defoliation in pine forests. Biology and life history The insect overwinters as eggs on pine needles in the upper canopy. In the late spring, the larvae emerge and begin to feed on the new needles as they begin to appear. They pupate in a chrysalis suspended by silk in the tree or underlying vegetation. In mid- to late summer, the adults fly and females lay their eggs. Because of their preference for tree tops, cultural controls in landscape settings are not practical. On small trees, larvae can be picked off and destroyed. Butterflies are often kept to low numbers by the many parasites specializing in Lepidoptera. Presumably, crown feeding birds also would feed on them.